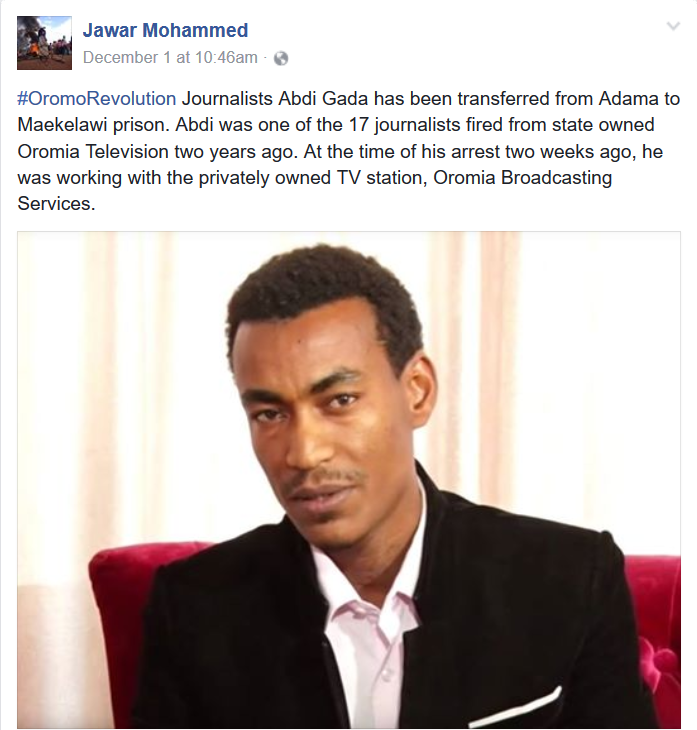 The list of incarcerated people below is the tip of the iceberg of the tens of thousands languishing in Ethiopian gulags. 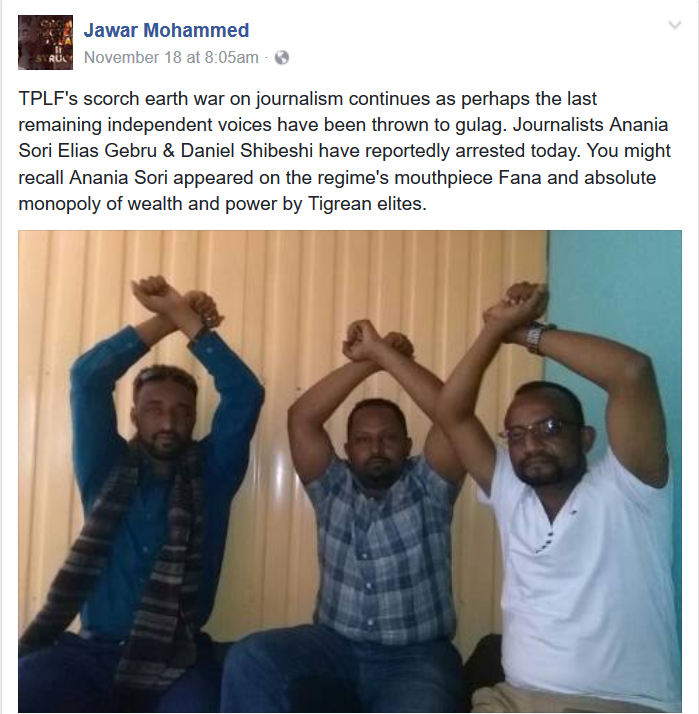 This list is prepared by compiling reports of reliable social media activists, human rights organizations and media outlets. Here, we document the incarceration of only activists, people known by the general public, etc. It should be noted that the vast majority of incarcerations are not reported on social media, to human rights organizations or media outlets. The current status of some of the incarcerated might change for better or worse as time goes by. We try to keep their status up to-date. The order of the detail is: Name/Gender/Description/Place and Date of Arrest of the victim. 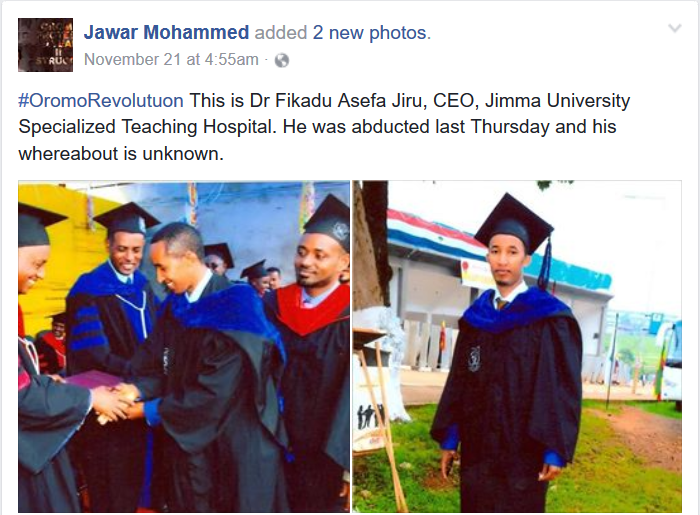 Dr Fikadu Asefa Jiru/CEO, Jimma University Specialized Teaching Hospital/Abducted on Nov 17, 2016 – Whereabouts unknown. 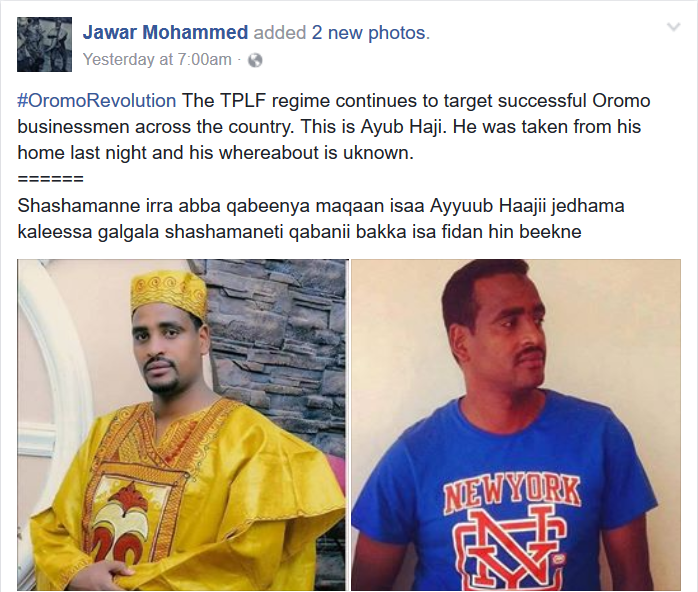 Released on December 22, 2016 from Awash 7 Federal Police Training Center. 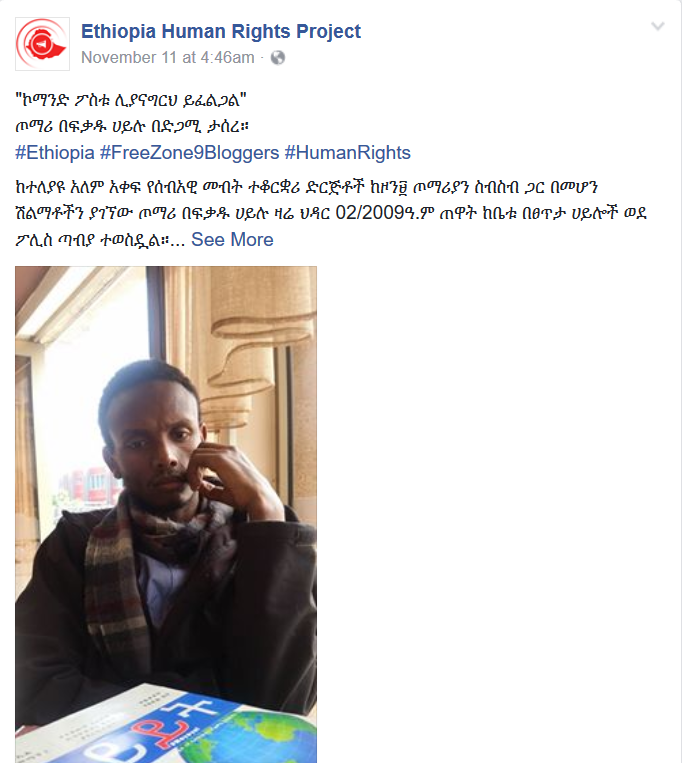 Here is a memoir he has written on Addis Standard after his release. 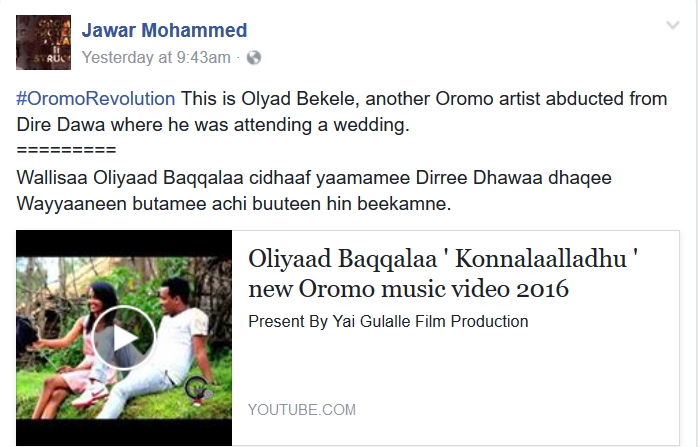 Obsonete Baqqalaa/Finfinne [Addis Ababa]/August 6, 2016 – Released on August 12, 2016. Severely beaten & can not move around. 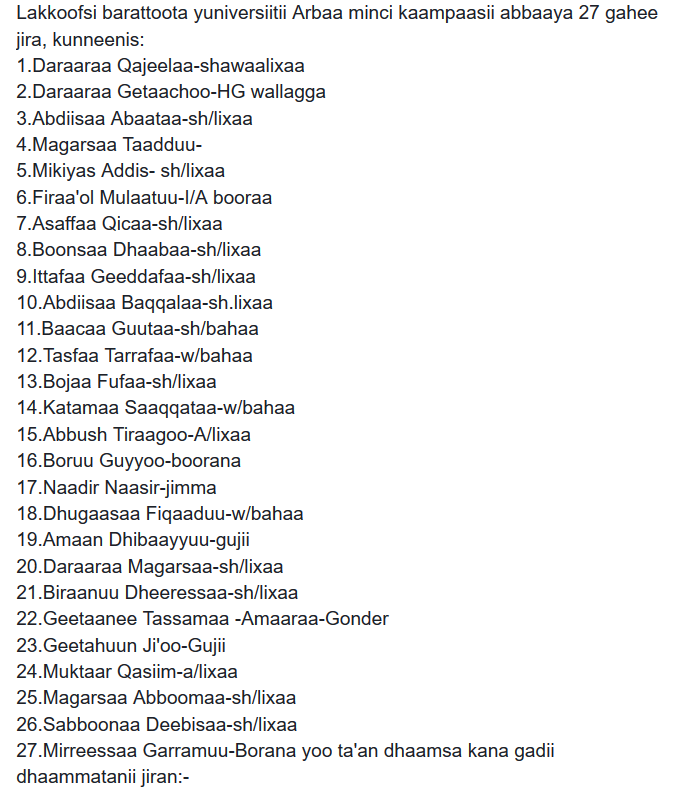 A list of 136 people charged in federal courts in relation to #OromoProtests is released [Amharic] by EHRP on August 3, 2016. 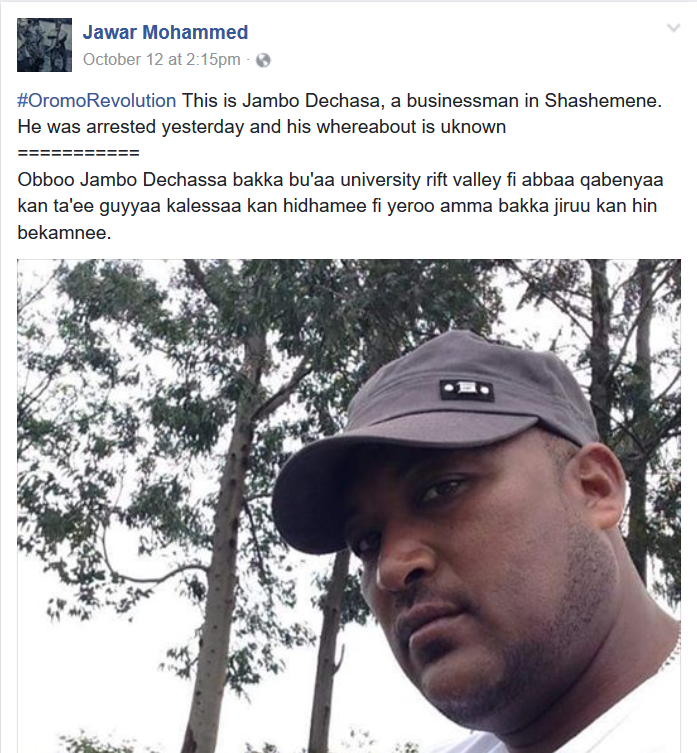 Three Rift Valley University College [RVUC] Labu Campus administrators have been arrested on June 9, 2016. 3. Calchisa Damte/Head of Distance & Continuing Education Department. Reported as badly beaten. 4. 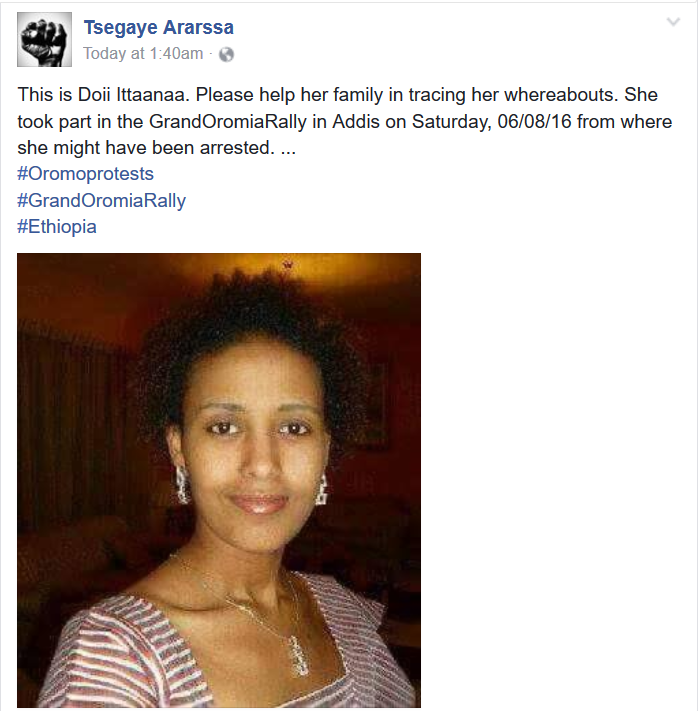 Dirribsa Damte/Addis Ababa University graduate. Have been imprisoned from 2011-2014 in Qalitti. 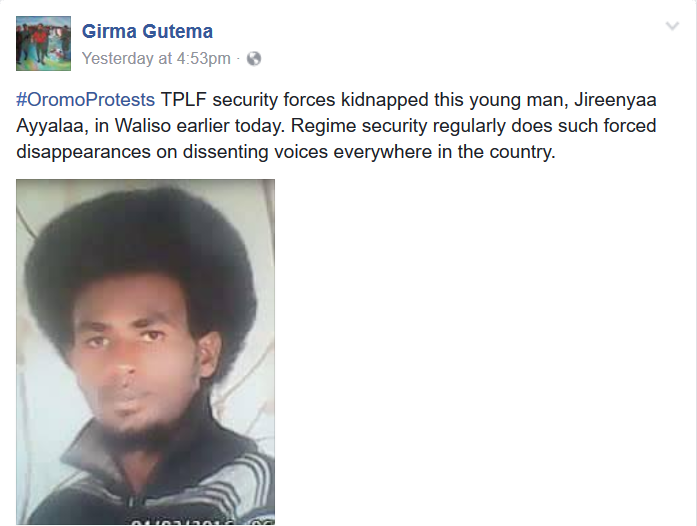 Two Dire Dawa University students kidnapped on June 4, 2016. 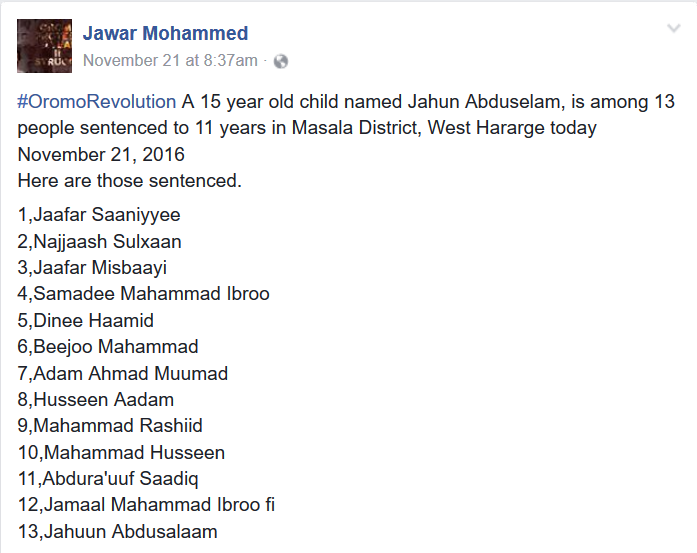 The following 16 students are arrested from Jannata & Waltasis Villages, Masala District, West Hararghe on May 17, 2016. 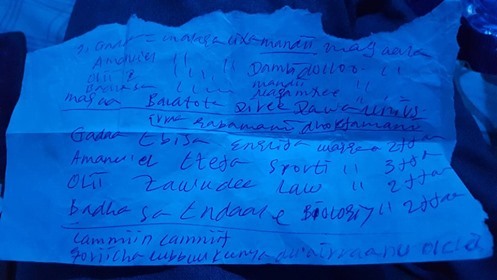 The whereabouts of the students listed from 5 – 16 is unknown. The following 4 people are arrested from Ambo, West Shawa on May 10, 2016. 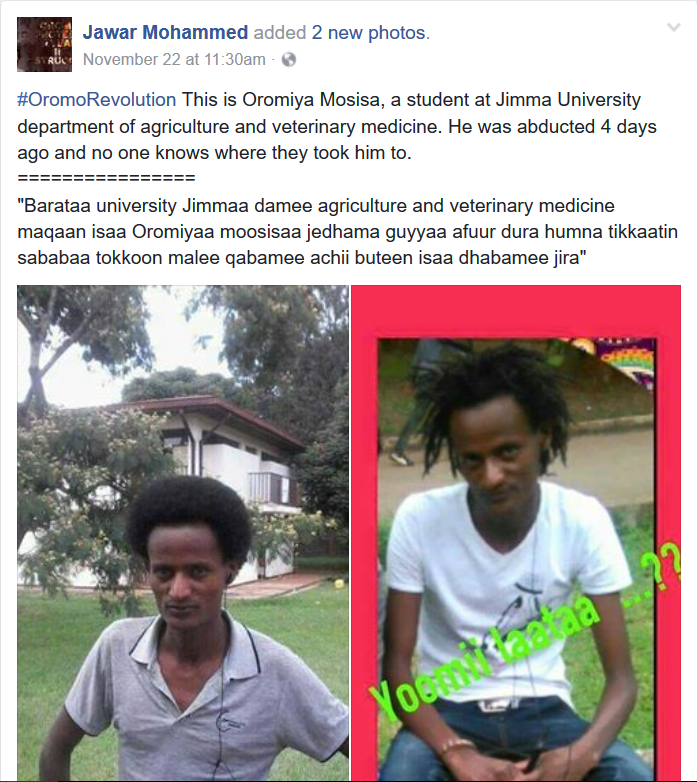 The following 5 Haromaya University students has been taken on April 30, 2016. 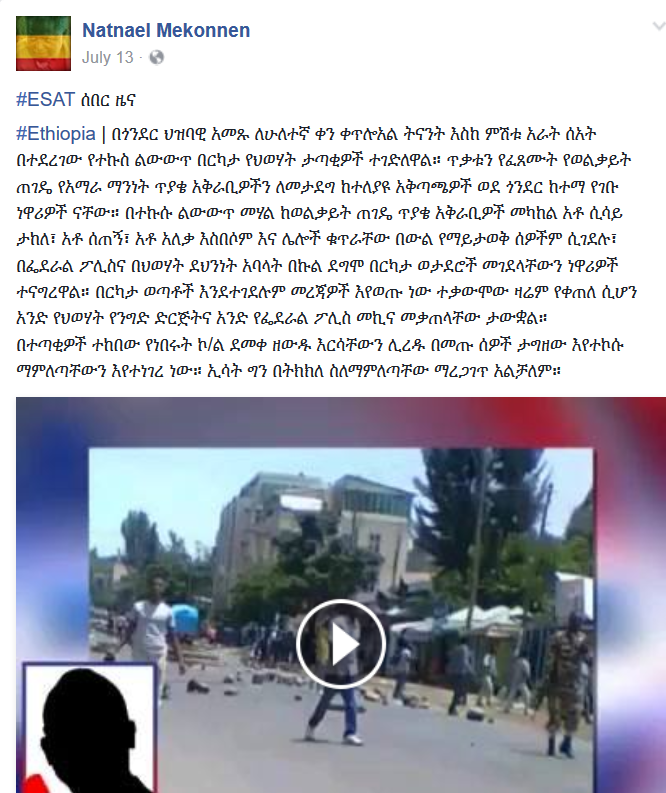 10 students taken to Ma’ekelawi investigation [torture] center from Mada Walabu University. Reported on Mar 15, 2016. 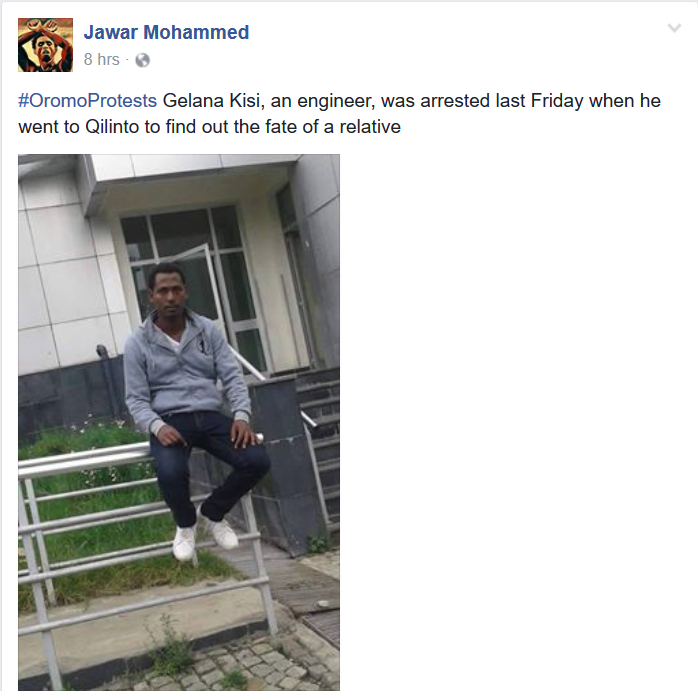 20 Addis Ababa University [AAU] students are arrested [Now at Qilinto detention center] for protesting in front of the U.S. Embassy on Mar 8, 2016 – Reported by Reuters. Totally 49 students are charged for “trying to break into a foreign embassy”. 3 are females. 29 released on bail on/before Mar 15, 2016. 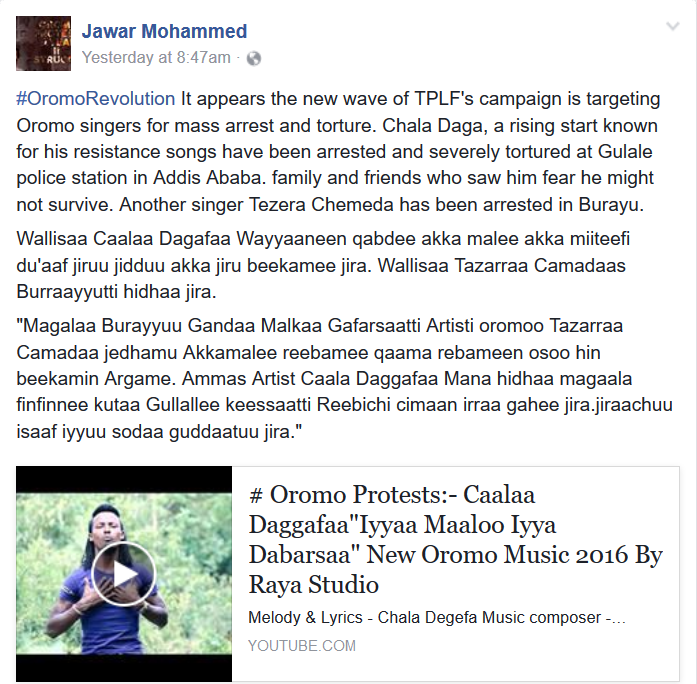 Jireenyaa Gadaa/M/Artist, singer/Jan 27, 2016 – A resistance song by the artist. Click here to follow his trial. 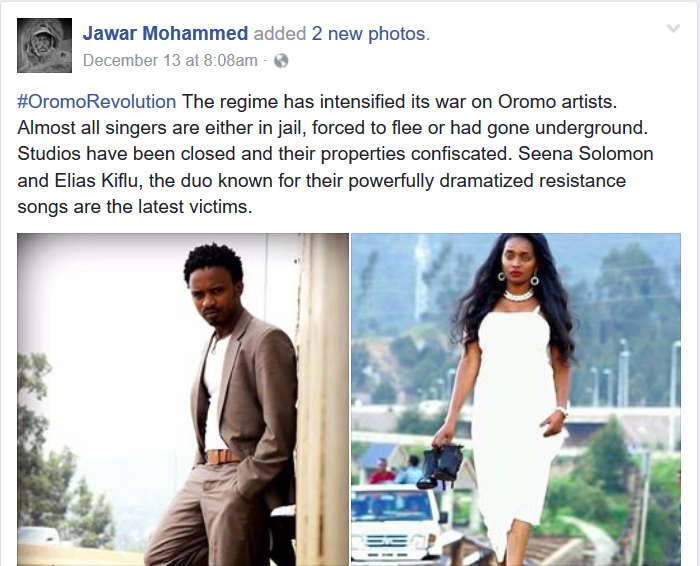 The 22 Oromo Federalist Congress [OFC] party leadership and representatives who are arbitrarily arrested & charged with “terrorism” are listed below. Click here to follow their trial. Reported by Reuters. 2. Dajane Tafa/Dep. Sec. 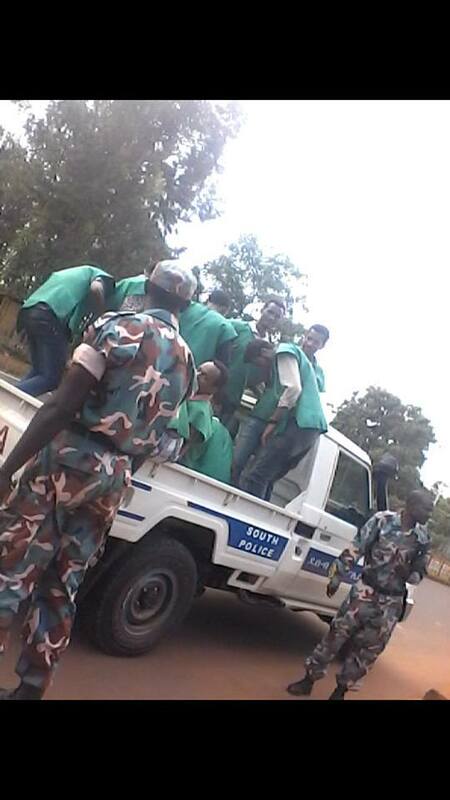 Gen. of OFC party/Burayu, Oromia Special Zone/Dec 24, 2015 – Picture below. 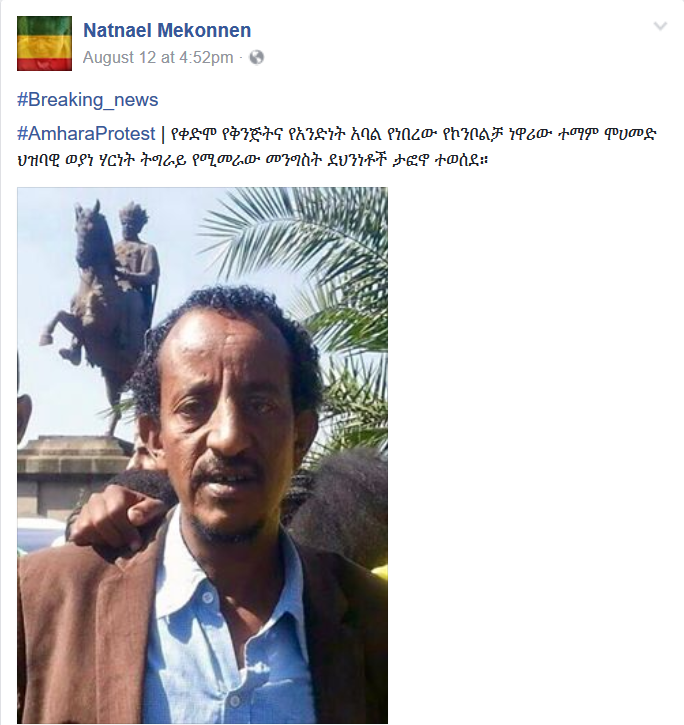 Released after detained at Ma’ekelawi investigation [torture] center for 5 months. 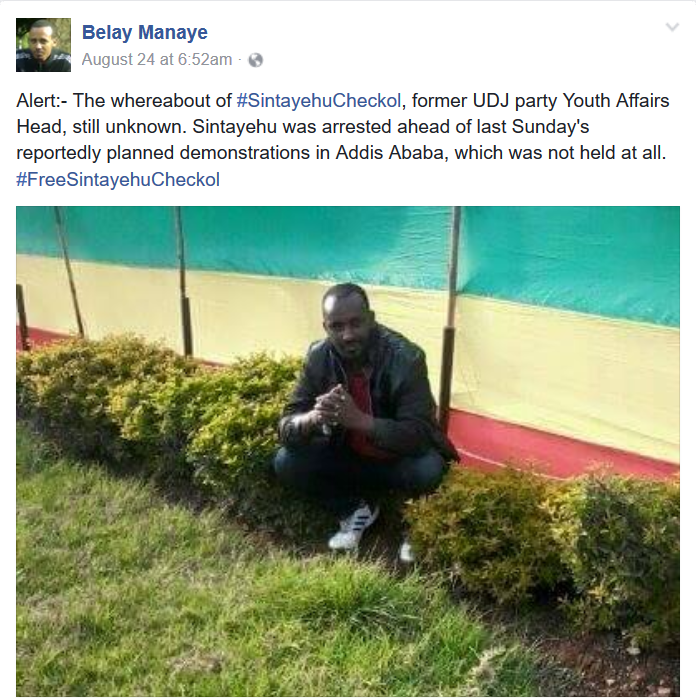 Court set him free on August 19, 2016. 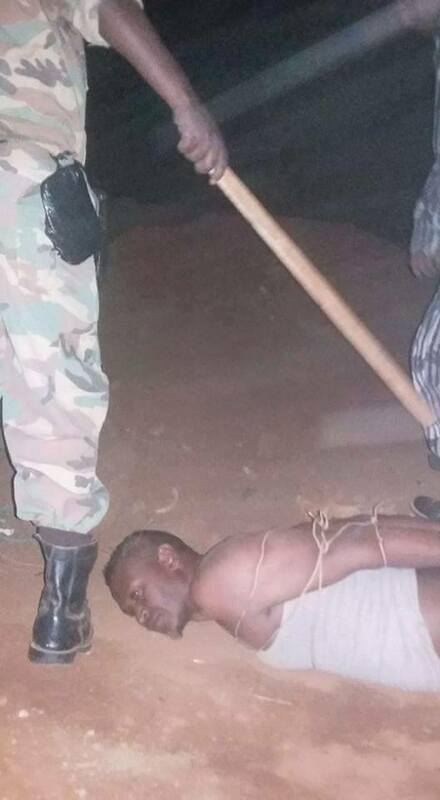 However, he was re-arrested just as he left prison even before he could greet his family awaiting him outside. Baqala Garba/Previously incarcerated from August 27, 2011 – March 31, 2015. 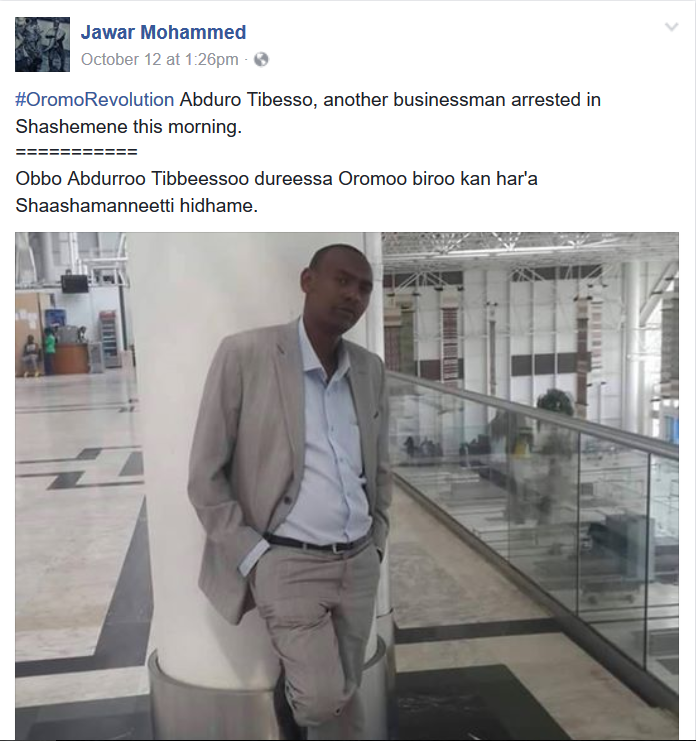 Arrested again on December 24, 2015 [See above]. * This post will be updated when we learn reports of release or incarceration.